So lately I’ve been enjoying Dottycookie, a fun blog of all sorts of crafty goodness over in the UK. She was sweet enough to nominate me for an award, or actually my choice of three of them. I received the Rockin’ Girl Blogger from my SP10 pal Marsha, so I’ll pass on the other two awards to some of my other favorite people of there. I’m so pleased that Val thought of me for these! One thing I love about blogging is the friendship and community that comes along with it. It try hard to leave comments on the blogs I read and respond to those who comment on my blog as much as I possibly can. Okay gals, go and share the love!!! Next post : Flood fundraising contest coming up. I just need to take pictures of the prize yarn! Thank you! I love reading blogs and meeting all of you amazing people. Aw, how sweet of you! Thank you! And you definitely deserve both of those awards, as well as the other one you got. Aw, thank you!! I’m very intrigued to hear about your flood fundraising…. Oh, thank you so much for the nomination!! You are indeed nice as can be! I’ve been meaning to post about the floods, too, but haven’t had time yet. My CSA farm was really hit hard. I feel so badly for the people down there! 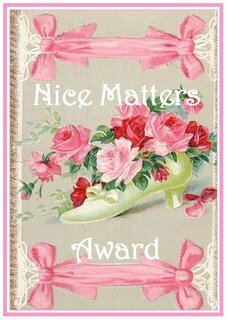 Wonderful awards and so nice of Dottycookie – I’ll have to go over there and take a look at her site now! Aw, gee! Thanks so much!